The Chinese New Year, known in Chinese as chūnjié 春节 (literally “Spring Festival”) is fast approaching. Since it follows the traditional Chinese lunar calendar it’s also sometimes known as the Lunar New Year. This is why every year it falls on a slightly different date according to the Gregorian Calendar, usually sometime in late January or early February. 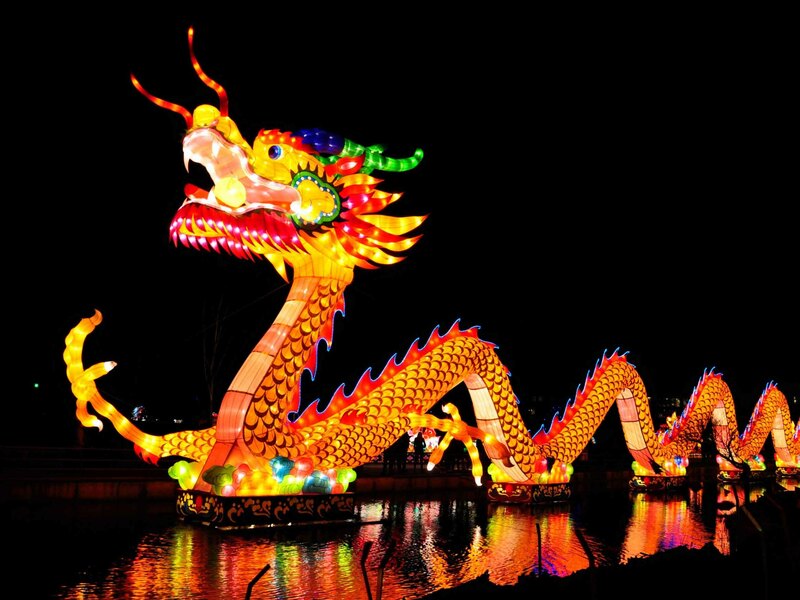 While it may have originated in China, Spring Festival is today a global phenomenon. It has exerted a strong influence in East Asia for centuries, especially in countries like Vietnam and Korea. In the 19th and 20th centuries, it followed Chinese immigrants to Chinatowns across the world. Today it’s celebrated, to some degree, in around 120 countries. Spring Festival’s traditions are rooted in a number of enduring themes and values. The idea of getting a fresh start is fairly universal, and this is no different in China. To this end, people will often give their house a clean sweep, buy new clothes and maybe even change their hairstyle! Of course in the context of Chinese culture starting afresh is inseparable from ideas of welcoming fortune or luck. This invariably involves that luckiest of colors, red. Red lanterns, red paper cuttings, and red spring festival couplets (chūnlián 春联) posted on either side of the door are some of the most common decorations. Another characteristic decoration is an upside down poster with the Chinese character for fortune or luck, fú福, posted on doors. This is related to the Chinese love of puns. The word for “upside down” and “arrive” have the same pronunciation in Mandarin Chinese (dào). So by pasting the character in this way, one is said to be encouraging the “arrival” of good luck. Get it? Ensuring a good year is not just about welcoming good luck, however. Stopping bad luck from coming into your house and into your life is equally important. This explains the liberal—and ear-shattering—use of firecrackers in Chinese celebrations, the noise of which is supposed to “scare away” bad luck. However, the Spring Festival value with the biggest practical impact is probably the idea of tuánjù 团聚 or “reunion”. Combined with traditional Confucian notions of filial piety (basically “respect your elders” on steroids), this produces a powerful stimulus for all to return home and guònián 过年, or ring in the new year, with one’s family. This even includes family members who are no longer “of this world”, and many Chinese will take the opportunity to make offerings to their ancestors. Once the family is assembled, it’s time for the main event of any Chinese gathering: eating —and lots of it! Meals occur throughout the extended Spring Festival season, but the most important is the New Year’s Eve reunion dinner or niányèfàn 年夜饭. Once again, the focus is on foods with a dual meaning. Fish (yú 鱼) is popular since it sounds like (yú 余), meaning extra or bonus. Dumplings are also common due in part to their resemblance to ancient Chinese gold ingots. One might also suspect that people eat fish and dumplings because, let’s be honest, they taste pretty damn good! The rapid development of the economy since the late ’70s has led to massive changes in Chinese culture. While traditions, especially Spring Festival, remain strong, they’ve also evolved to serve the needs of China’s changing people and society. Increasing prosperity brought TVs into the homes of many Chinese for the first time in the 1980s. This led to what has become one of China’s most popular modern traditions, the CCTV New Years Gala or chūnwǎn 春晚. This marathon four-hour variety show has been popular since its first broadcast in 1983. In China, it’s common practice to have it on in the background during the New Year’s Eve dinner. Usually, around 800 million people tune in, making it the most watched TV program in the world. The transition to a market economy has also caused Spring Festival to become more and more commercialized. Online retailers like Taobao and JD.com usually see around a 200% increase in sales leading up to the Spring Festival. This is a natural outgrowth of the gift giving that has always occurred during New Year, accelerated by Chinese consumers’ rising purchasing power. Common gifts include fruit, candies, and clothing, but the most iconic gift is still the red packet or hóngbāo红包. Red envelopes filled with cash, hóngbāo are usually given by older people to younger people (especially children). Many Chinese companies also give red packets out to employees: part year-end bonus, part inducement to come back after the holiday! Over the past few years, red packets have also gone digital thanks to the growing popularity of online, mobile payments. In 2017, WeChat users sent a record 14.2 billion digital red packets—on Lunar New Year’s Eve alone! One of the most awe-inspiring aspects of Chinese New Year is the chūnyùn 春运, or Spring Festival travel period. It’s been called the largest annual migration (of humans, at least) on the planet. This year, the total number of internal trips is expected to surpass 3 billion during the 40-day travel season! In pre-modern China, reuniting with one’s family usually meant walking next door or to a nearby village. But after reform and opening, migrant workers from the rural interior moved to take advantage of new economic opportunities in the cities. Despite the cost and time, the urge to spend the holidays with one’s family sends these migrants home every year. The most common way to do so remains by train and even China’s enormous rail system struggles to accommodate the flood of passengers. For Spring Festival 2018, a projected 340 million Chinese will take the train home. You’ve still got a week before the big event, so if you haven’t put up your lanterns or prepared your red packets, there’s still time! Come back next week to learn more about the Chinese zodiac and the upcoming Year of the Dog! Still making plans for the holiday? Check out our articles about Transportation in China and our Top 5 Places to Visit in China! And if you’re interested in fully supported language classes or internships in China, consider applying for one of our award-winning programs today! I love to celebrate the spring festival. Its a joy full celebration of fireworks, light, and color.